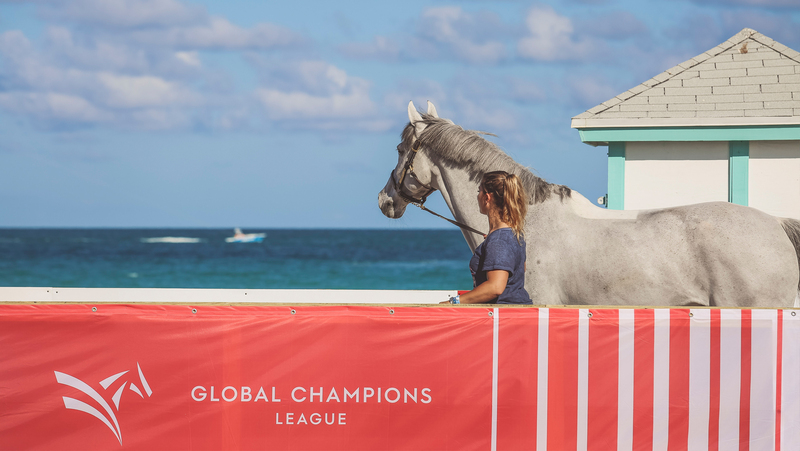 Today’s opening GCL competition in the Miami Beach 2018 CSI5* 1.50/1.60m class over Italian course designer Uliano Vezzani’s track offers the first chance to see who the 19 teams in the GCL — the team series — are fielding. As well as forming the first of two parts of the team contests here in Miami Beach, the class acts as a stand-alone individual division for the 57 starters in terms of results and prize-money, so competition is doubly fierce. Against the spectacular backdrop of the turquoise Atlantic sea, some of the sport’s best riders will be tackling the Miami Beach ring for the first time — so who should you keep a particular eye on? The home team, the Miami Celtics, are fielding Ireland’s Denis Lynch (RMF Cadeau de Muze) and Michael Duffy (EFS Top Contender) in the first South Florida team tussle. As the winners of the opening 2018 leg in Mexico City, they are currently leading the rankings at this early stage of the season. Ben Maher of Great Britain flies the flag for the London Knights riding Don Vito; Maher was on this team when it won the GCL Miami Beach leg in 2017 (with the USA’s Kent Farrington). Today he partners with Belgian rider Nicola Philippaerts, who also claimed a podium here individually in 2017 — so their combined skill and experience means they can definitely not be discounted. Philippaerts partners the ultra talented H&M Chilli Willi, a 10-year-old gelding by Casall. The Monaco Aces are another team to bring past experience to this Miami Beach GCL leg; Belgian rider Jérôme Guéry (Garfield de Tiji des Templiers) may be the only non-French rider on this team, but he won the Longines Global Champions Tour Grand Prix here last year and has the powerhouse Simon Delestre (riding Gain Line). The brand new combination of Germany’s Christian Ahlmann and the Dutch rider Leopold van Asten form a team for the first time — this makes the Scandinavian Vikings an unknown quantity, but don’t discount them on that basis. Youth could come to the fore in the shape of the Paris Panthers: the 21-year-old Jennifer Gates is a strong rider who’ll be boosted by the support of a home crowd aboard Luftikus S, and she’s teamed up with Ireland’s Darragh Kenny on the first-drawn horse, Team de Coquerie. The Paris Panthers also finished second in Mexico City, so are breathing down the leaders’ necks. Another American rider bidding to capitalise on home advantage is the popular Laura Kraut (Confu), who rides for the Rome Gladiators. She’s joined by the on-form Italian rider Lorenzo de Luca whose Irish gelding Limestone Grey helped make him one of only two riders who pulled off a double clears at the season opener in Mexico City. The formidable horsepower making up the New York Empire team is accompanied by the London 2012 team showjumping gold medallist Scott Brash who rides the nine-year-old gelding Hello Shelby, while his teammate Georgina Bloomberg rides the 13-year-old stallion Manodie II H.
Other teams to watch include Valkenswaard United (series winners in 2016 and second last year), with Italian rider Alberto Zorzi on Contanga 3 and Ireland’s Bertram Allen on Gin Chin van het Lindenhof, while the Montreal Diamonds (who were called the Hamburg Diamonds last year and won the Global Champions League title) boasts the top riders Jos Verlooy and Eric Lamaze — both of whom were on the team last year. Spectator entry is free for the duration of the show (5-7 April), while for anyone unable to attend, all classes are broadcast on a free live-stream — with expert commentary. Be sure to follow LGCT on social media, and don’t miss your chance to interact live with some of the world’s top riders via our interactive Facebook Live sessions, which will take place throughout the show.